I am always amazed by the sheer loveliness of my fellow bloggers. One such lovely blogger is Ruth over at Bullish Ink. 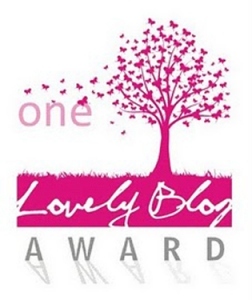 She has bestowed upon me the One Lovely Blog Award; my very first award on the new blog! Thanks! 1) I dislike whipping cream. In fact I’m not much of an icing person either. 2) The first thing I do when I come home from work is take off my socks. 3) If you looked in my closet right now you’d find that nearly all of my clothes are either black or purple. 4) I only eat pineapple if it’s on pizza. 5) I own a Underwood typewriter that’s from the 1910s. 7) I have to move my mouth when I use scissors. Apparently this helps them work better. I’d love to give this award to so many people. I have a fantastic network of blogger friends that ROCK so much that it leaves me in awe. I know many of those lovely bloggers have also received this award so I don’t feel so bad about not adding them to my list. You all know who you are! Instead I’ve deiced to choose just a few really cool bloggers that you should definitely check out! You’re welcome! Yeah the typewriter is awesome and it only cost me $10! Hi, Angie! I just wanted you to know that I posted about this award today. Thanks again!